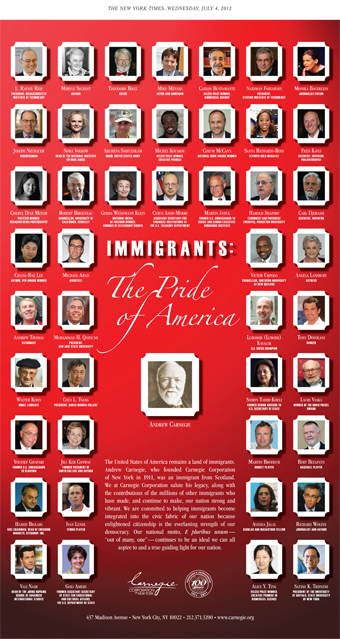 We are proud to announce that three of our 2012 prizewinners were among those cited by the Carnegie Corporation of New York in its annual full-page public service advertisement, “Immigrants: The Pride of America.” This PSA, which appears each year on the Fourth of July in the New York Times salutes the contributions of foreign-born Americans to the United States. Congratulations to Carlos Bustamante, Vilcek Prize winner in Biomedical Science; Michel Kouakou, recipient of the Vilcek Prize for Creative Promise in Dance; and Alice Ting, winner of the Vilcek Prize for Creative Promise in Biomedical Science! To see all those honored this year, go to Immigrants: The Pride of America.